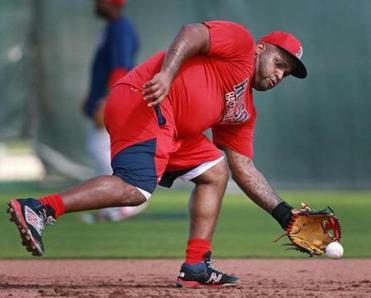 Pablo Sandoval arrived early at training camp, but his reported weight loss appeared to be exaggerated. 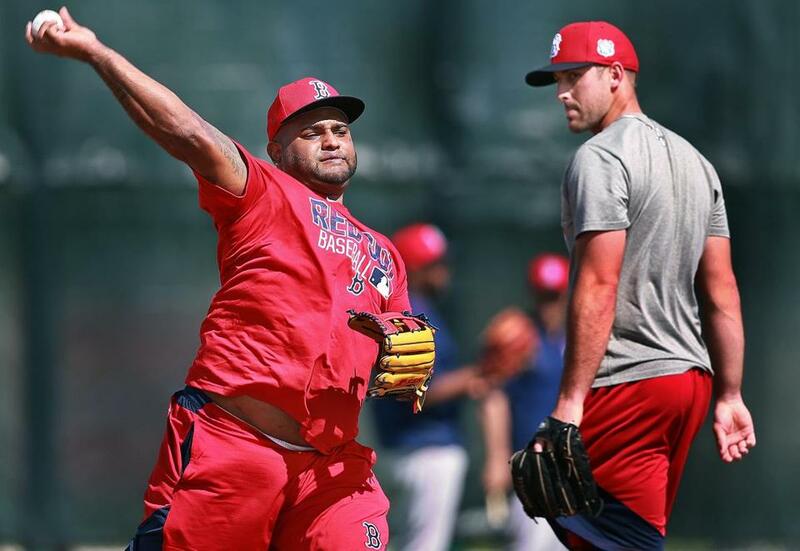 FORT MYERS, Fla. — Pablo Sandoval arrived at Red Sox spring training camp Sunday morning, looking just as big as he looked when he arrived last spring. Maybe even bigger. Mercy. Get a load of that gut. if we didn’t know better, we’d suggest that Pablo appears not to be taking things seriously. The Panda Watch had consumed folks in Fort Myers throughout the weekend. Last week Farrell casually mentioned that Sandoval would be in camp Saturday and when Pablo didn’t show on Saturday, the fat hit the fan. Sandoval became the first player in baseball history to get ripped for not appearing in camp four days before the first full squad workout. I looked everywhere for him Saturday night. I checked the deli counter at Publix and the popular Two Meatballs in the Kitchen restaurant off Daniels Parkway. I even went to the Regal Cinemas Belltower 20 to see if he might be taking in the late show of “Kung Fu Panda 3” but . . . no luck. Meanwhile, Sandoval was taking a beating on social media. At 7:30 a.m. Sunday, the Wait gave way to The Weight as Panda strolled into the clubhouse for the first time in 2016. Video crews from Comcast and NESN were there to record the moment. Minutes later, Panda came out of the clubhouse and greeted Farrell. Photos were snapped as the two walked arm-in-arm past the barbecue grill outside the clubhouse. Pablo then went to the cages to hit. At 9 a.m. he took questions from the media in front of his locker. It was an unsatisfying session. Pablo smiled and talked a lot about winning and being a good teammate. But he didn’t give Sox fans what they likely wanted to hear. Next he was asked if he considers last year (.245, 10 homers, 47 RBIs, 15 errors in 126 games) a personal disappointment. It went downhill from there. 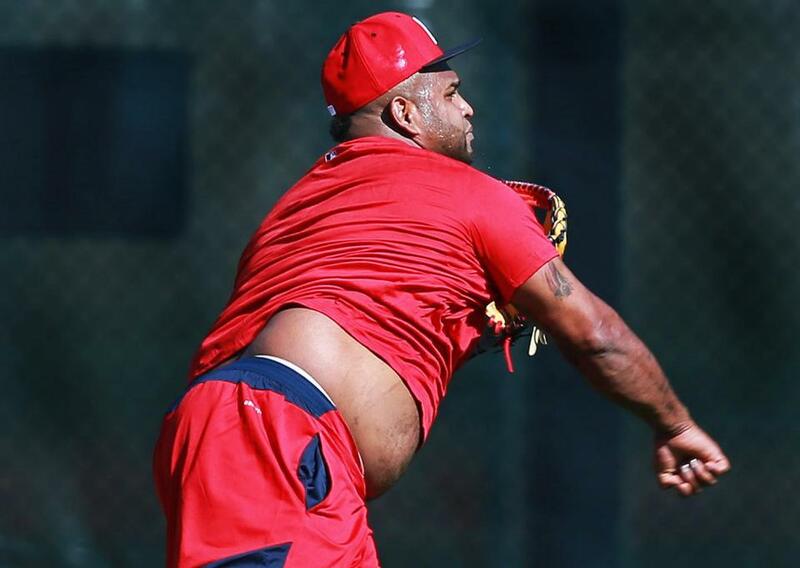 A well-meaning reporter noted that Farrell said Sandoval lost 20-22 pounds over the winter. Was it Pablo’s goal to come into camp in better condition, we wondered? 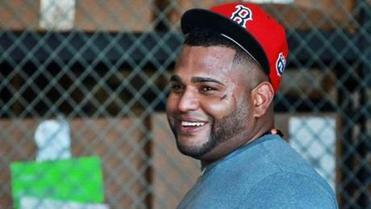 Pablo Sandoval was all smiles after batting practice. Did anyone from the team talk to you about weight, or ask you to lose weight? Shocking. When then-interim manager Lovullo met with the media in Cleveland at the end of the Red Sox 2015 last-place season, he said the Sox were going to ask Sandoval to lose weight during the winter. Dombrowski said the same thing at the Winter Meetings. 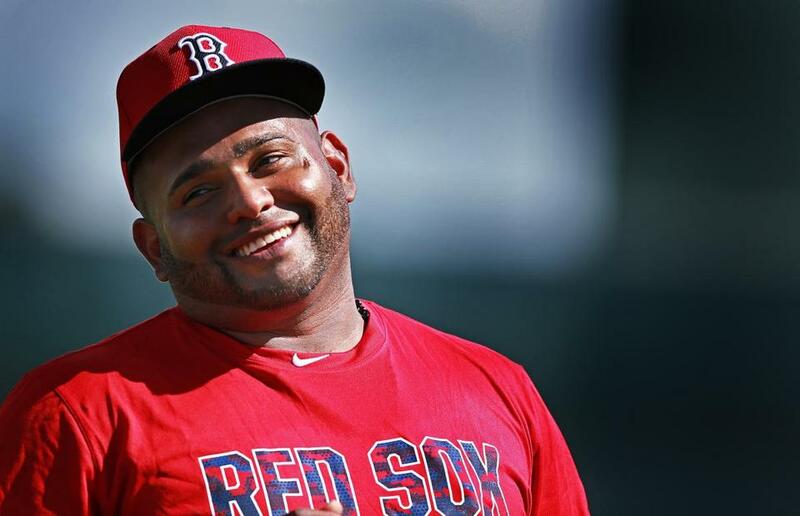 At the writer’s dinner in January, Farrell said Sandoval had lost 20-22 pounds. If this is true, Panda must have been in Wilfork-land when he started shedding. Based on what we saw Sunday, Pablo’s weight loss must be like the proverbial two deck chairs tossed off the Titanic. Farrell attempted to clarify things after Sunday’s workout. 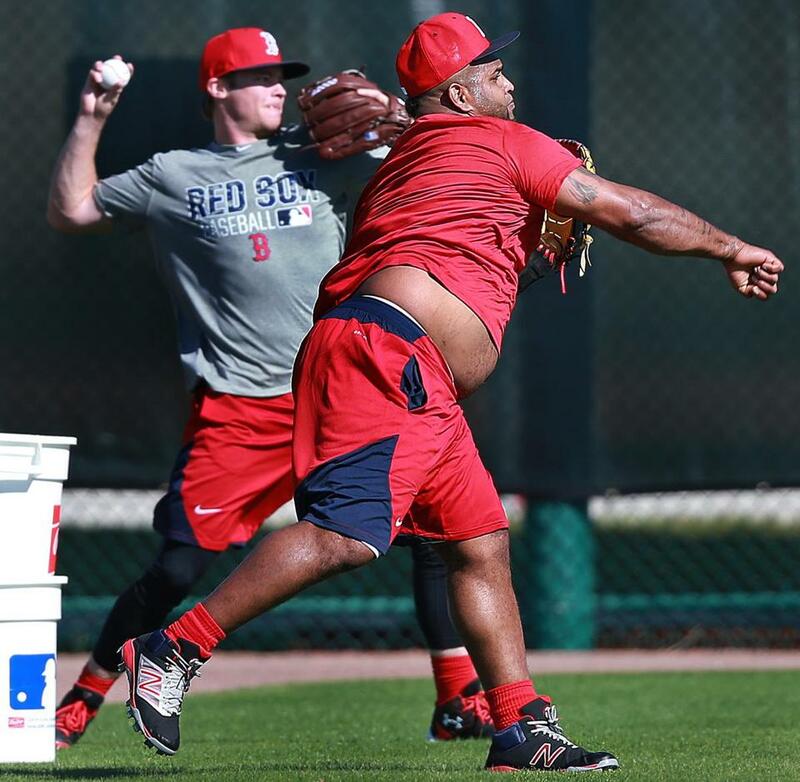 Farrell repeatedly stated that Sandoval looks to be in better condition than he was at the end of the season, but no one is talking numbers of pounds. Nice. But the damage was done. We need to remember that Sandoval is speaking in a second language when he takes questions from the English-speaking media. He is a pleasant and polite fellow and he looked pretty heavy when he was hitting .426 in three World Series Octobers. All that said, this was a disastrous introductory news conference for Pablo Sandoval. He is coming off a horrendous first season after signing a five-year, $95 million contract. He is a professional athlete and has been in the big leagues since 2008. We thought he’d look different. And the Red Sox should have prepared him better. The optics on this are bad and some of the words are likely to stick. Sandoval was on the field with other Red Sox players. Sandoval was on the field with other Red Sox players, including Travis Shaw, who also took ground balls with him at third base. Sandoval appeared to be happy to be at spring training.